The Sleight screen in Kingdom Hearts Re:Chain of Memories. A sleight (from "sleight of hand") (ストック技, Sutokku Gi?, lit. "stock technique") is a type of special technique in Kingdom Hearts Chain of Memories and Kingdom Hearts Re:Chain of Memories, activated by certain combinations of two or three cards. Sleights are used by Sora, Riku, and human and human-like bosses. Sora may learn sleights through leveling up, progressing through the story, obtaining certain cards, or opening treasure chests, while Riku gains all of his sleights early in his story. Each sleight has certain requirements to be activated, and most require all three stockable cards to be a certain type or value. Some sleights only require two cards; these Sleights will activate if the stocked cards don't fulfill any three-card Sleight, and can be activated with only two cards if desired by "stocking" the reload card instead of one in the player's deck, or by pressing and simultaneously in Re:Chain of Memories. As sleights are activated through a combination of stocked cards, the first card in the sleight will disappear from the player's deck unless certain enemy cards are activated, but they can be recovered with high-level item cards. Sora's sleights are divided into "Attack", "Magic", "Summon", and "Friend" sleights, which are categorized based on the cards they use. Re:Chain of Memories also introduces two sleights unique to the Bumble-Rumble mini-game. 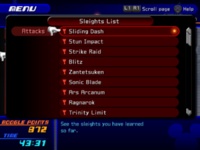 Riku's sleights are divided into "Attack", "Friend", and "Duel" sleights. Unlike other sleight types, "Duel sleights" can only be used by activating a duel, and can include up to seven cards. Since the first card in a stocked combo is removed from the player's deck when the combo is used, the player can quickly be reduced to a few weak cards if they abuse combos without arranging them into efficient sleights. It is advised to build multiple layers of sleights into a deck, ensuring that cards may be used in multiple sleights, even after initial sleights remove cards from the deck. Three attack cards of the same type. Three attack cards of differing types. See the Magic page for information regarding naming conventions and spell levels. Riku does not learn sleights through the same methods as Sora. Instead, every sleight he learns is given to him after leaving Hollow Bastion and talking to Ansem and The King. In Chain of Memories, these depend solely on Dark Mode and the The King Friend card, but in Re:Chain of Memories, the Duel system and its sleights are added to the game, allowing Riku to perform more sleights on his own. Inparusu?) Knock foes into the air before a slam down to the ground, damaging multiple enemies. Win a duel that requires you to break three cards. Dāku Inparusu?) Knock foes into the air before a hard slam down to the ground, damaging multiple enemies. Only available in Dark Mode. Win a duel that requires you to break three cards. Meirusutoromu?) Unleash a spinning attack on the enemy. Damage is concentrated to one enemy. Win a duel that requires you to break five cards. Dāku Meirusutoromu?) Unleash a powerful spinning attack on the enemy. Damage is concentrated to one enemy. Only available in Dark Mode. Win a duel that requires you to break five cards. Barāju?) Throw the Soul Eater towards the enemy. Damage is concentrated to one enemy. Win a duel that requires you to break seven cards. Dāku Barāju?) Throw multiple Soul Eaters towards the enemy. Damage is concentrated to one enemy. Only available in Dark Mode. Win a duel that requires you to break seven cards. ↑ "Lethal Frame" was mistakenly translated as "Lethal Flame" in the original English release of Re:Chain of Memories, but was corrected in the HD 1.5 ReMIX re-release. This page was last edited on 3 April 2019, at 18:48.